Sainsbury is in a sweet spot. In a domestic market where peers are wrestling with severe structural and cyclical headaches, Sainsbury is growing sales, market share and pretax profit. One of the few uncertainties is whether Chief Executive Justin King wants to prolong his decade-long reign. With the business purring along nicely, Chairman David Tyler is likely to want to keep his high-achieving chief executive. When King took over in March 2004, Sainsbury had decisively surrendered the title of UK grocer top dog to Tesco. Since then, King has reinvigorated the brand to the extent that market share is outstripping Britain’s second-biggest retailer Asda, according to Nielsen data, and pretax profit is above Morrisons’. His is the only mainstream supermarket to successfully fight discount retailers and high-end outfits like Waitrose. Sainsbury’s investors are unlikely to grumble if King stays. In the next five years, he could help manage the development of online retailing and smaller convenience stores, where sales are expected to grow 124 percent and 30 percent respectively, against 8 percent for bigger stores, according to consultant IGD. That could help Sainsbury eat further into the market-share lead of Tesco. But persistent low-level speculation has it that King might have itchy feet. However successful he might be, King is unlikely to close the 13 percentage-point gap with Tesco entirely. Although the larger rival has had a difficult few years, the underperformance is unlikely to persist indefinitely. Tesco’s shadow looms over Sainsbury in another way, too. Its former chief executive, Terry Leahy, stayed for 14 years before leaving in 2011. Although Leahy is not to blame for all Tesco’s current difficulties, long-serving chief executives can create entrenched cultures. The longer King goes on, the more the fortunes of Sainsbury will be about him, not the firm. King, who is 52, has time enough to take on another big job. If he does leave in the coming months, the current strength of Sainsbury suggests the transition should be a smooth one. That would help Sainsbury’s next CEO meet the in-store and online challenges ahead. Now is as good a time as any for the board to nail down a smooth succession plan. 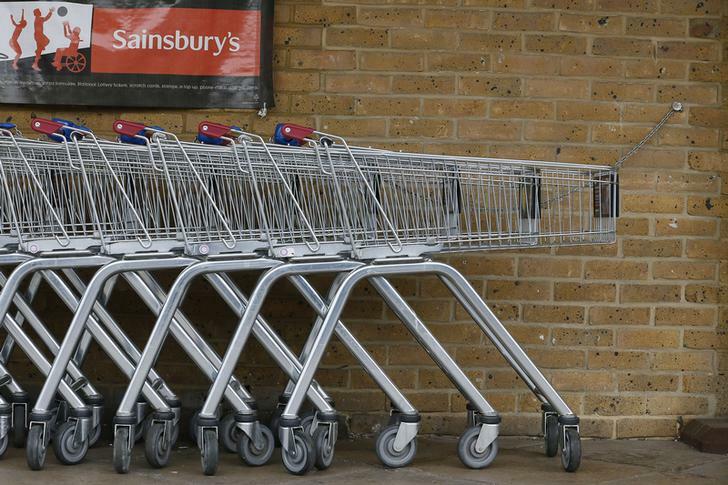 Sainsbury’s like-for-like sales excluding fuel rose 1.4 percent for the 28 weeks to Sept. 28. The UK supermarket chain said on Nov. 13 that pretax profit had risen 7 percent to 400 million pounds year-on-year. Sainsbury’s share of the UK groceries market is now 16.8 percent, according to Kantar data for the 52 weeks ending Oct. 13. Sainsbury’s Chief Executive Justin King could step down in March 2014, the Financial Times reported in April. As of 1100 GMT on Nov. 13, Sainsbury’s shares were trading at 416 pence, up 4.3 percent.